I was disappointed when I watched you show last week featuring Harry Connick Jr. He laughed and joked about taken pain medication and their effect on him. Pain medication is no joke. There is nothing to laugh about. Millions of Americans are addicted to these medications. They started out innocently enough and found they liked the effects too much and continued to use them. It quickly became an addiction. Millions of people lose jobs, family, and some even their lives to this addiction. I respectfully request you remember this the next time you have a guest who wants to make light of their use of pain pills. BTW, I feel so sad when I see you cry. Being a celeb and in the media picks up on all .....but for some strange reason most is focused on negative and I cannot tell you enough how you have provided me with positive. I have been very sick and you are the one I look forward to every day to give me hope. Thank-you for that. attention scott rose,,,,,,,i too sent ellen one of my better frog paintings over 5 years ago and never got a responce one way or the other.this is a padern with celebs,. i sent one to martha stewert, and nate burkis too and never got a thank you or a sorry but no thanks or any thing.one woman who i did send a painting to did respond and i hold her in a verry high reguard today.that woman would be elyse luray from the PBS show the history detectives.she loved it ! she is a art expert after all and no better person to have one of my works on her wall.lol. and ime sure your art is fantastic too scott.you have the right idea.and event if it is in some ones livingroom other then ellen its still out in the world and not in your house.youve planted a seed and seeds take time to grow.just keep doing what your doing and crank it up to a higher level and DONT'E STOP! persistance is a proven success strategy.the sqweekey wheel gets the grease. Hi Ellen Im Just writting to say i think you have the funniest show on tv, so how about you inviting that guy to your show off of the American Idol to sing pants on the ground thats an hit!We love that catch pharse thank you. 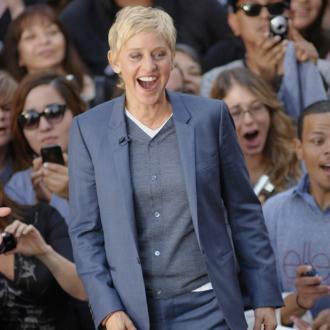 Ellen DeGeneres, First I want to say Congradulations on your marriage. I wanted to tell you that I'm also getting married to my partner. Our names Jimmy Gattis and Michael Hoover. We plan on getting married July 14th 2008. That's the news flash. 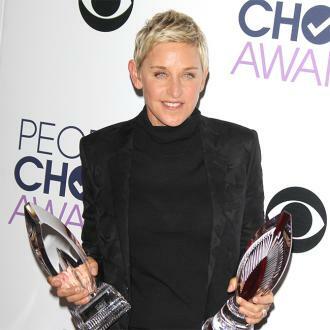 Coming from a gay woman's perspective, I think that Ellen Degeneres is an icon in both the straight and gay community. Helen is a comedian that is multi-talented and for that person who has made so many negative comments, I want to say to that person, Have you reached this far in life as Ellen has? I know the answer to this question. Then just shut your big Mouth. Lesbians have come this far in life and have been through this great battlefield. I agree for her not to disclose any personal information on her show. Does Montel Williams discuss his girlfriends on the air and does he talk about the wonderful experience he has had ever since he was able to discover that he is heterosexual. I say two thumbs up for Ellen. 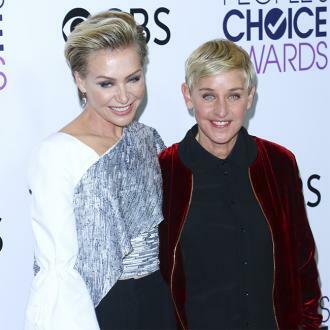 She's worked this hard and come this far and I wish her all the blessed luck in her relationship with portia de rossi. I think they look great together just like me and my baby look. Good night. I think Ellen needs support for her kind heart, and I'm outraged at the way that this women from Mutts & Moms handled the situation.What can I do to help return the little dog igge to the girls. I'm a hair stylist too! with many dogs and this hurts my heart and I will assure you that the dog is hurting. Please help! Ellen is nice, intelligent and amazing! Personal life is just personal life. What matters if she is lesbian or not? We need to give a break in these stuffs of colour, sexuality, nationality. We're all human beings. We're all here looking for happiness and a good life. Straight people, gay people? Bulls**t. Everybody has the right to be themselves and everybody has the duty to leave others live their lives as they wish. She is so cool. That person who keeps bad mouthing her can get lost, have you ever heard the saying "if you dont have anything nice to say, dont say anything at all." I look up to her as a person, im gay and shes a great roll model. "Her personal life is just that, personal?" Gimme a break, she made her fame by coming out and rubbing it in our face. Then she cheats on her girlfriends. But now she's afraid to speak about her life on her new show, she must have signed a "don't ask, don't tell" agreement with the producers. Have you EVER heard her say the word gay or lesbian on her new show? Or talk about her private life? Nope. She's a censored whore. I think everyone is pretty much aware of the fact she is gay.no need to talk about it.And her personal life is just that,personal. A "beloved television icon"? Gimme a break. She cheats on her lovers, is sort of back in the closet with her new show -- she never talks about her sexuality or love life on her show, she's afraid it will have a negative effect on her audience. She probably had to agree to the producers of the show to keep her mouth shut about her sexuality. She's a censored whore. Sorry,I forgot that you are in a different time zone,i am in central.I apologize.please respond when you can. Thanks and God Bless! I would like to ask Ellen a personal question about my life,and what i am thinking right now? and also would like to see if i can get tickets to her show somewhere?